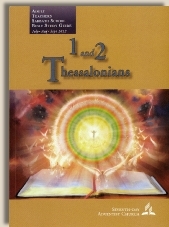 Today, the author says the key theme of the passage (1 Thessalonians 4:13-18) is the act of reuniting with each other and being together with Jesus. Interestingly, this idea does not come from Scripture, but rather from Ellen White, the Adventist prophet. “As Paul’s epistle was opened and read, great joy and consolation was brought to the church by the words revealing the true state of the dead. Paul showed that those living when Christ should come would not go to meet their Lord in advance of those who had fallen asleep in Jesus.”- Acts of the Apostles, Page 258. The key theme of this passage from a purely Biblical standpoint, is to comfort and edify the church with the knowledge that those who are in Christ will experience no separation from Him. Paul teaches that those who are alive when Christ returns will have no advantage over those who have preceded them in death, because ALL believers are equally in Christ. The author of the Sabbath School Lesson states that the key theme of this passage is to teach that loved ones will be reunited with one another as well as with Christ. This is not a Biblical teaching. The New Testament writers are clear that to be in Christ means just that: in Christ, without separation.